Akron Children's Hospital and HKS Inc. Articulate the relationship between project planning and transition planning for people. Identify opportunities to deploy change engagement directives during the project planning and implementation process. Identify why change engagement is necessary, and effective, in all planning and design projects, based on systematically collected data. With the best of intentions, most experienced design teams, and informed and involved user groups, still find it is a challenge to organize the move into a new space, and operationalize the new environment at the targeted efficiency and performance. Change management becomes a key concern as a transition is made which is not just geographical, but fundamentally cultural. To prepare staff to optimize a new space and processes it is essential to understand, and address their concerns early on, and continue to address these during the transition planning. A series of pulse-point surveys have been conducted with the staff of the ED and the NICU of Akron Children’s Hospital prior to moving into a new facility, and continued six months and one year post occupancy. For the ED the first survey was conducted in October 2013 with 47 responses. The second survey (identical to the first) was conducted in June 2014 with 88 responses. For the NICU the first survey was conducted in Oct 2014 with 49 responses. The second survey (identical to the first) was conducted in April 2014 with 43 responses. In the interim between the two surveys change engagement initiatives were undertaken at varying levels given the unique circumstances being experienced by each group at that time. 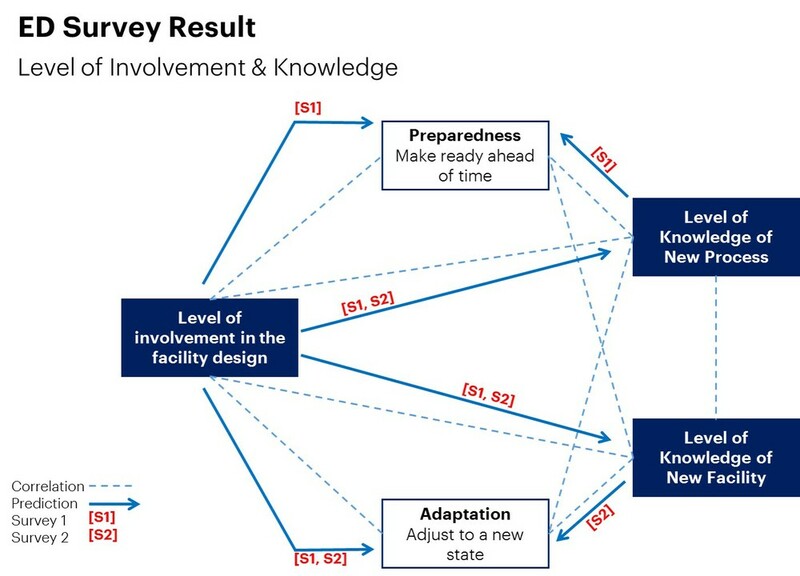 The preliminary analysis on the first two surveys showed that being involved in facility design was the key: 1) to increase knowledge of process and environment, 2) to increase ED’s perceptions of both preparedness and adaptation, and 3) to increase NICU’s perception of adaptation but not preparedness. Knowledge of facility and knowledge of process did not have the same impact on ED and NICU group. Knowledge of process and facility increased NICU’s perception of their ability to be ready ahead of time. Knowledge of facility increased ED’s perception of their ability to adjust to the new space, while knowledge of process increased ED’s perception of their ability to be ready ahead of time. The analysis also showed being part of the design team led to both more adaptation and preparedness for ED and NICU. ED’s involvement in design activities led to more adaptation, while NICU’s involvement in process activities led to more preparedness. Findings will be updated upon completion of data analysis for third and forth surveys. What interventions help staff prepare and adapt and when should they be implemented? What kind of ripple effect do these results (with the staff) have on the patient and family? What role does leadership play in the staff’s willingness to adapt and be prepared? What design process is the most effective for preparing staff for their new environment?